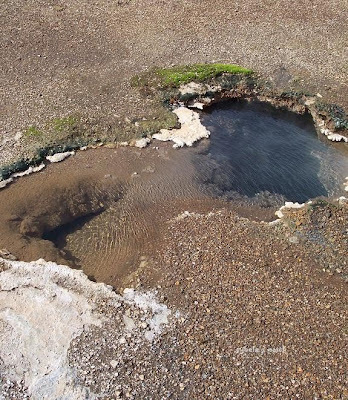 Of the hot springs in Iceland the Great Geysir and the Strokkur are the most famous. And it really is breath taking to see the hot water moving and then burst out into a fountain every seven minutes. The Strokkur is the most active but he was not really showing off when we where there. What I also found just as interesting were the ordinary hot springs. 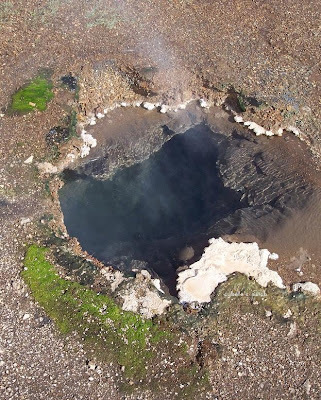 They looked like poodles of water but at a closer look they were very deep and the water was boiling hot. Amazing. I held my hand about 50 cm above the spring and still felt the heat. How very interesting. Looks like Earth is breathing and huffing and puffing. That's awesome. What an amazing capture. Wow...looks very dramatic! Very well captured! Indrukwekkend en ik vind het altijd leuk iets bijzonders over een land te lezen! Ook je vorige post was bijzonder om te bekijken! wow! this is a spectacular place! the first photo is amazing! 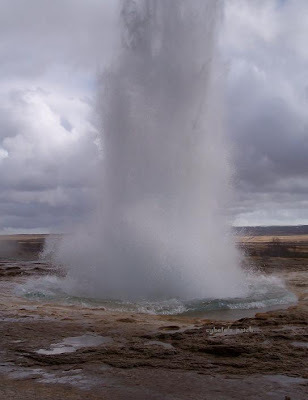 The picture of the geyser is impressive!! But my favourite photo is the third one. I embiggened it so I could see the ripples in the water better, and the reflections of the clouds!! Thanks for the fascinating information about your hot springs and geysers. Although the geyser is impressive, the hot springs are beautiful. That's a fascinating place to visit. Melting Icicles is my entry for Watery Wednesday. That's a lot of water. Great capture! impressive and pretty geysers, great photos of 'em! There are so many people that don´t think the water is very hot and put their hand into it and get burned!